Joshua grew up in Schenectady, NY where he cultivated a love of small shuls and was an active member of the Upstate N.Y. NCSY circuit. After graduating from the University of Rochester with a BA in Religion and a minor in Film Studies, he studied for three years at Shapell’s Darche Noam in Jerusalem. He received rabbinic ordination from Yeshivat Chovevei Torah in New York City, serving as the rabbi of Atria Assisted Living in Riverdale and interning at Bais Abraham Congregation in St. Louis, where he met his wife Andrea. 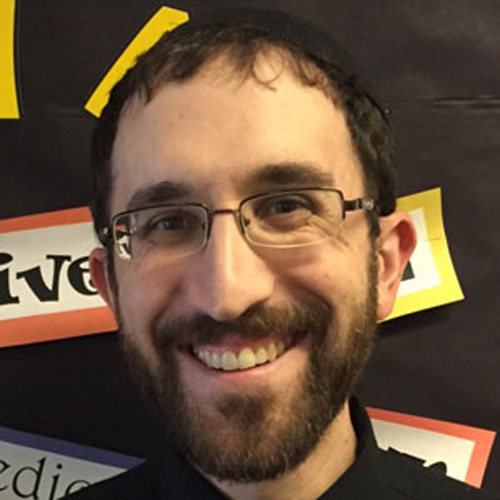 Following his ordination in 2012, Joshua served as the rabbi of Kehillat Ohr Tzion in Buffalo. In addition to leading the shul, he was a faculty member of the adult education program at the Bureau of Jewish Education; taught Hebrew and halachah at the Ohr Temimim day school; was a member of the Buffalo Board of Rabbis; and offered classes at Kadimah Community Day School, UB Hillel, and the Hebrew High School. In 2017, Josh and Andrea moved their family to join the faculty of Farber Hebrew Day School. Josh enjoys playing jazz piano, watching classic movies, and reading.